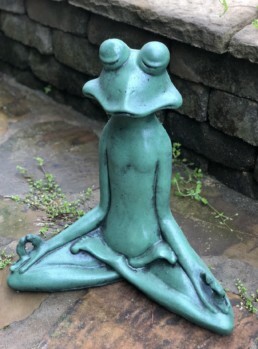 Zen Frog or his new name “Zenny”. He’ll look great under our palm tree by the pool! 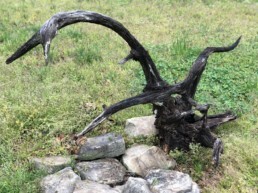 By far the best yard art is hidden within nature already! I lost my dad about 10 years ago, but have constant reminders of his creative imagination in so many things. Yard art is one one of them for sure! 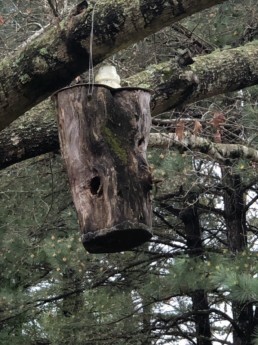 He had a keen eye for repurposing things, like this bird house he fashioned from a small log of wood, and placed a while insulator on top as a focal point. (He worked for Norfolk and Southern Railway for 30 plus years and has a pretty cool insulator collection!) I’m sure you will be seeing more of how he used insulators for art decor in future blog posts! 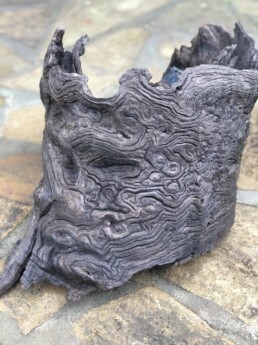 This was a root ball that he made into a planter! The raw organic detail…you can’t find this at the local department store! I LOVE THIS! Now this is really cool and I bet not everyone knows what it is! It’s a Cypress Knee that can be found in swampy areas like good ol’ Louisiana. They anchor Cypress trees through strong winds. Another gift from Dad that warms my heart when I see it! 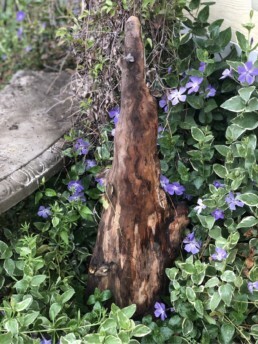 I hope this has inspired you to shop the “Wild Wilderness” store for your next yard art! You’ll get way more for your money, I mean, your FREE time!